If you like to change your hair -colour, length, style- all the time, then you are my kind of girl! I, in particular, like to change my hair colour pretty often. From a natural brunette to a bold ombre and more recently to a plumy-purply brown!! Therefor, my hair are severely damaged and with very dry ends. As a girl who likes her long hair and is not yet ready to chop them off, I searched and searched for an alternative. 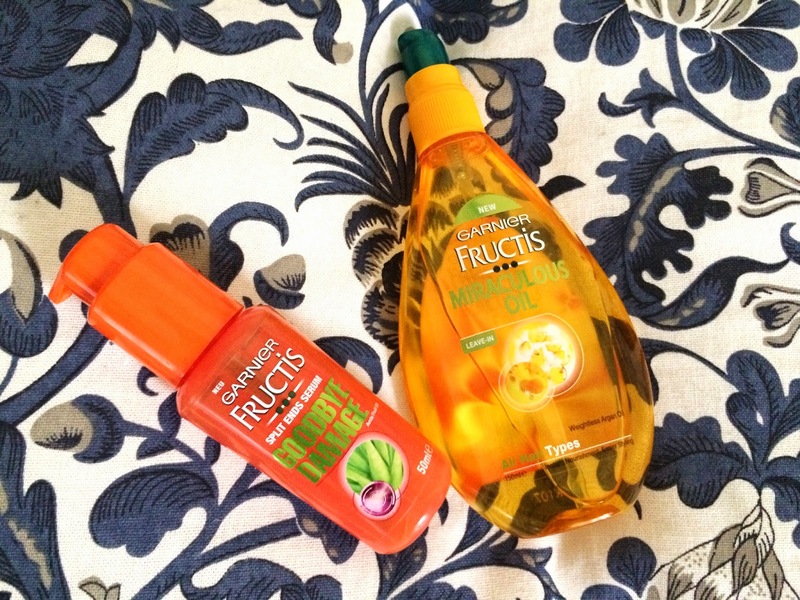 And Garnier Fructis came to the rescue. Two hair oils, the Miraculous Oil and the Goodbye Damage Split Ends Serum are my saviors. I apply the Miraculous Oil everytime I wash my hair when they are damp and after they dry I apply the serum to the ends of my hair for extra nourishing. In between washes if my ends feel dry I apply some more of the serum and it makes them feel soft and revitalised. If your hair are like mine, then give this duo a chance, as it will probably save your life - or at least hair! !